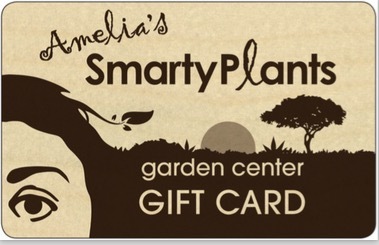 Amelia's SmartyPlants: Spring Has Sprung! April is the ideal month traditionally for spring cleaning. This applies to your yard and gardens as well. Freshening up old planting beds or implementing new landscape designs are a great way to get started. Here at SmartyPlants, Paul has been busy changing the layout of our sun area. Plant groupings are in place to show compatible plant combinations and colorful mass groupings. Paths among the plants invite you to meander peacefully in the garden and give you ideas for your own garden paths. Walking among the plants instead of just in front of them, provides more of a feeling of being part of the garden. Our palm selection has relocated to the sun area. Diversity and organization make it easier to find just the right palm tree. Stop in and take a look at the nice changes that may give you ideas for your own garden. Planting a tree or shrub in memory of a lost loved one or a pet is becoming more popular. A dedication plant can also be done to mark significant events like the birth of a child, buying a new house, graduating from high school or college, or just as recognition to a good friend or family member. Easter weekend is a great time for a dedication planting. Although plant options are endless, the Aphelandra hartwegiana is currently in a spectacular stage. It is from Central America and can reach 8' to 10'. In late winter and early spring, it produces coral colored bracts that open into yellow flowers - simply exquisite. It requires average water, minimal fertilizer, and can be trimmed back and easily maintained at 4' - 6'. It is an 'eye-catcher' for sure. Also known as the yellow Aphelandra, this is an excellent dedication plant. For Easter weekend (Friday, Saturday, and Sunday), 3-gallon are 10% off and 7-gallon are 20% off. April and May are usually the driest months of the year. With the hot summer heat approaching quickly, now is a good time to check your irrigation system. Clean out sprinkler heads and trim back plantings that have grown and maybe reduced the sprinkler coverage that all your plantings require. Trim dead wood and branches from trees and shrubs. If you didn't fertilize in March, do so now. Fluff up mulches or pine needles with a soft rake and add new mulch. This will aid in holding moisture for the coming heat. Replace the winter annuals with tough summer survivors like vinca, purslane, or coreopsis to give fresh bursts of color. Easter Lilies have arrived in small and medium pots. They are 20% off. We will be closing at 2:00p.m. on Easter Sunday this weekend to spend time with our families.